Their calculations held some surprises and a 9.4 percent increase over 2011. Poultry and eggs remained the top agricultural commodity at a predicted $2.53 billion. Soybeans, with an estimated record value of $1.16 billion, moved past forestry to claim the No. 2 spot in the state’s rankings for the first time. No. 3 forestry saw a 7.7 percent increase and estimated value of $1.03 billion. In addition to its record value, Mississippi’s soybean crop set a record for average yield. 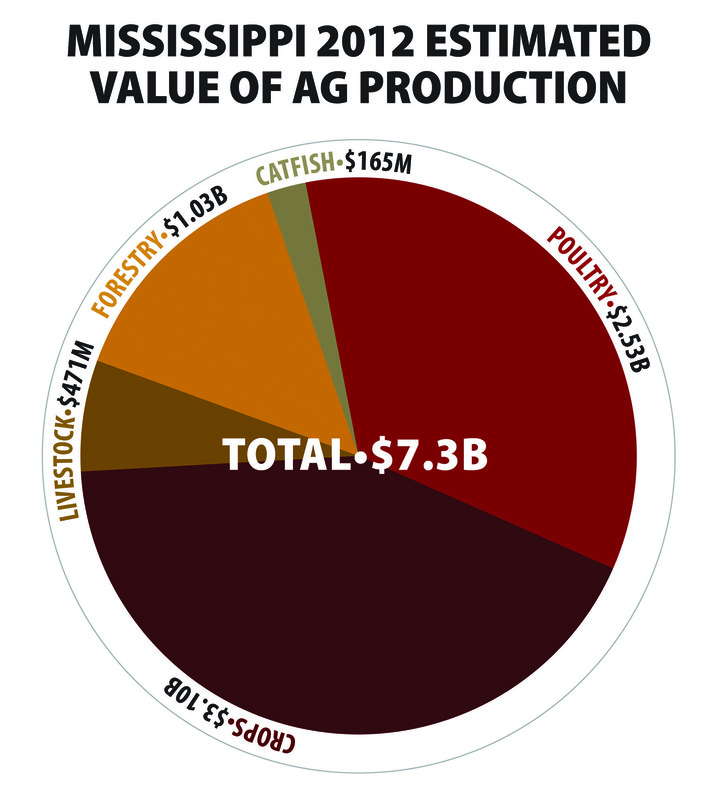 Mississippi fields averaged 42 bushels per acre, and the state produced 82.3 million bushels. Soybeans also benefited from record prices in 2012, averaging nearly $14.55 per bushel, according to USDA estimates. This year’s corn crop came in at No. 4 with an estimated production value of $891 million, the highest on record. As of mid-December, corn had the highest-ever yield per acre at 156 bushels. The number of bushels harvested -- 1.22 million -- is the highest since 2007, and the second highest in Mississippi’s history. Cotton moved down one spot to No. 5, with a decrease in production values of 43.9 percent in cotton lint and 19.6 percent in cottonseed. In the livestock sector, cattle and calves saw an increase of 38.7 percent, with an estimated production value of a record $329 million, which pushed it up in the ranks to No. 6. The state’s catfish industry continues to feel the pinch of high feed costs and has an estimated 23.4 percent decrease from 2011. With an estimated value of $165 million, catfish fell to No. 7. Hay moved up one spot to No. 8 this year, in part because of drought conditions in Arkansas and Missouri, which caused a spike in sales. The value of hay produced in the state set a new record at $145 million. One of the most noticeable declines was in rice, which decreased 14.8 percent compared to 2011. It slipped from No. 8 to No. 10 in spite of the highest yield-per-acre average since 2007, at 7,100 pounds per acre. Hog producers saw a 7.6 percent decline this year, with the industry’s production value estimated to be $102 million. This keeps hogs ranked at No. 11, the same as 2011. The No. 12 commodity is horticultural and specialty crops, including nursery and ornamental plants, valued at $96 million, up 2 percent. MSU Extension Service agricultural economist Ken Hood said the estimated value of the state’s sweet potato crop is about $79 million for 23,000 acres of sweet potatoes harvested in 2012, putting the crop at No. 13. With a 192.6 percent increase in production value, peanuts jumped over milk and grain sorghum to take the No. 14 spot. Milk and grain sorghum rounded out the annual rankings. No. 15 milk saw a decrease of 12.1 percent, with an estimated value of $40 million. Grain sorghum increased 7.2 percent, with a predicted value of $23 million for the 46,000 acres harvested.